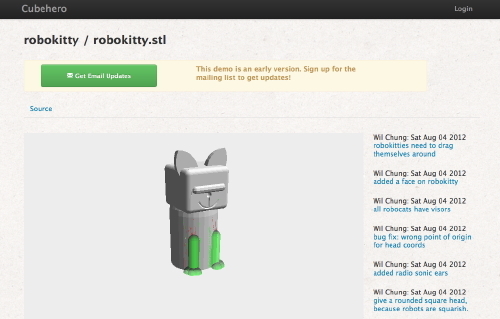 I have a demo up of visual diffs for 3D printable models. Here you can see a specific model, and … you can see diffs as I changed the model. We’re excited to see new tools for collaboration like this being developed. Besides visual diffs, the project aims to provide visual versioning, 3D object sharing, and bill of materials integration. Cube Hero is looking for interested possible users, so go check it out–they’re accepting signups for updates and launch invitations. This entry was posted in Everything Else and tagged 3-D printing, open source. Bookmark the Permalink.